Leaking Transmission or Axle Seal? There are different seals located throughout the automotive drivetrain. 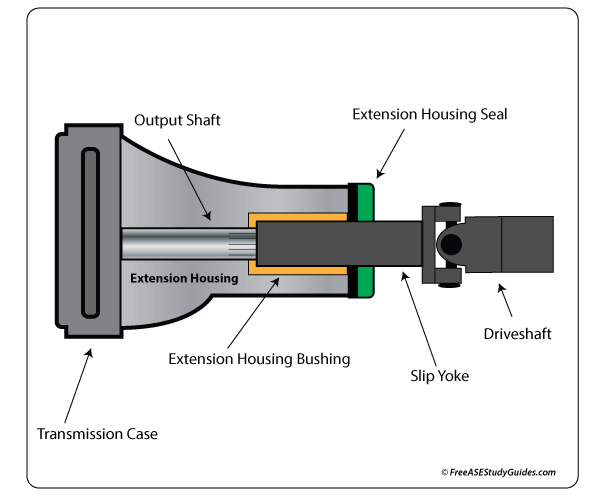 The extension housing located at the end of a longitudinal transmission contains a seal, a bushing, and a bearing. A worn extension housing bushing can lead to extension housing seal failure. If the clearance between the bushing and the driveshaft slip yoke is excessive, both the bushing and the seal must be replaced. A clogged vent will cause pressure to build as the transmission heats up. This pressure will cause fluid to bypass or damage the extension housing seal. This seal rides on the slip yoke as it both spins and moves in and out as the vehicle travels down the road. Pitting or damage of the driveshaft yolk will cause extension housing seal failure. It’s important to look for each of these underlying conditions, as they will lead to extension housing seal leakage. 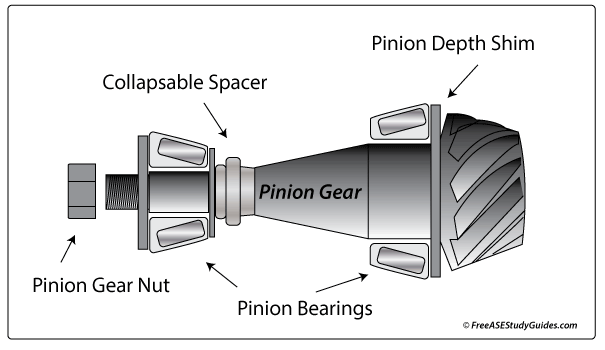 The pinion shaft seal is located on the front of the differential housing. There are different methods for replacing this seal. When removing the companion flange, check it for any pitting or damage. Always lubricate the inside lip of this seal and the accompanying hub on the flange before installation. Be careful not to over torque the companion flange nut as this will damage the collapsible sleeve. Once this collapsible sleeve has been over torqued, it must be replaced and the bearing preload reset. Tighten this nut in steps, checking it with an inch pound torque wrench along the way. Some axle seals are designed to serve a dual purpose. They contain and protect the brakes and sealed ball bearings from differential fluid. The housings contain an inner as well as an outer axle seal. The inner seal contains differential fluid protecting a factory sealed bearing assembly. The outer seal contains fluid and provides protection to the brake system. Continued axle seal failure may be caused by a bent axle. If the axle shaft is bent it should be replaced. Worn bearings will result in axle seal failure and can be identified by a whining or whirling noise that increases with vehicle speed.